Google Calendar is a great application for reminding you of your important appointments and meetings. 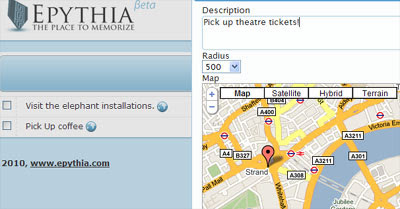 It can even show you on a Google Map the locations of your appointments. What it can't do is remind you to do something when you come near a specific location. This is where Epythia comes in. Epythia is a new (currently in Beta) service that can remind you to do something when you are in the proximity of a defined location. For example, you can set a reminder to pick up those freshly roasted coffee beans when you come within a mile of your favourite coffee shop. Then whenever you happen to be passing within touching distance Epythia will ping you your reminder. This is such a simple but brilliant idea. I'm always reading about exhibitions, cafes and shops that I like the sound of and thinking I must visit them when I'm in the area. Nine times of ten however I will forget. With Epythia I no longer have to miss out. Epythia is currently in Beta. This means that you can set reminders for locations and set the radius within which you wish to be reminded. However, unless I'm missing something (a lot of the site is in Russian) there doesn't actually seem to be an app yet which will ping you the reminder. I am assuming that applications will be on the way soon for most smart phones. Meanwhile you can always access your saved map on your phone's browser just to check what locations you have posted to visit. Hi, I'm Roman, Project Manager of Epythia startup. Feel free to ask questions here or on my email roma(at)epythia.com!